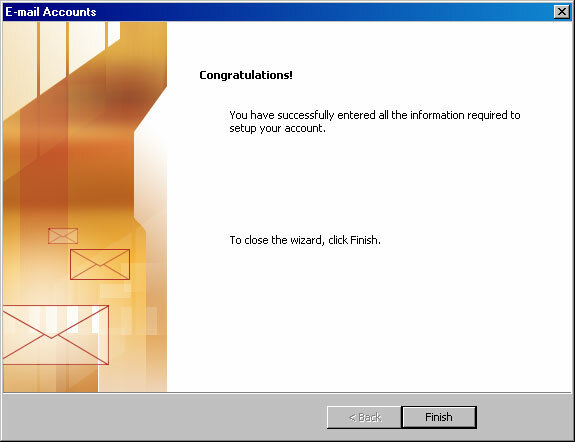 Begin by opening Outlook 2003. Click the "Tools" menu at the top and you will get a drop-down window. Click on the "E-mail Accounts" option and a new window will pop-up. Select the Add a new e-mail account option. All text boxes on this screen must be completed. POP3 Server: The format is "pop3." + your domain (ie: "pop3.abc.com" ). SMTP Server: The format is "smtp." + your domain (ie: "smtp.abc.com" ). User name: Your user name is your full email address (ie: john@abc.com). Password: Enter your password in box. Check the remember password box. Click on the More Settings.. button in the lower right corner after you've filled in the boxes. Check Use same settings as my incoming mail server radio box. 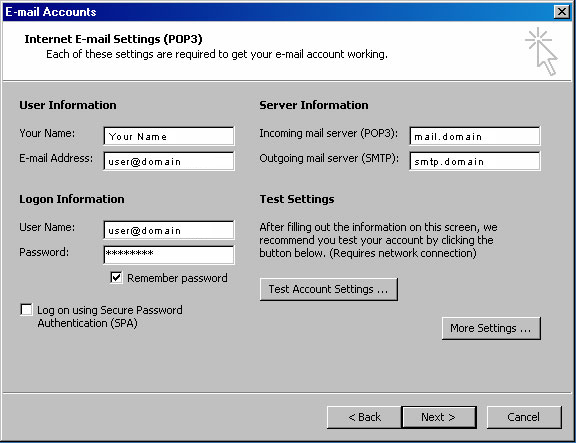 You will see the status of the SMTP and POP3 connections in the Test Account Settings dialog box. Click close after all tests complete successfully. If any "Tasks" don't get a green checkmark then write them down. Double check all your settings and try the test a second time. If some of the tasks fail, plesae call Tech support and be sure to tell the tech that you are using Outlook 2003 and that you did a test connection which identified certain areas where you aren't able to use your e-mail (Those are the areas that didn't get a green checkmark). If you successfully tested your account settings then click the "Close" button. Click Next on the Internet E-mail Settings (POP3). Click Finish on the Congratulations page.